Mountain scrambling is an exhilarating way to ascend a mountain but attempted by the inexperienced it can be a dangerous choice of outdoor pursuit: the wrong choice of route on the wrong day can lead to disastrous consequences. Scrambling requires experienced route finding, navigational skills, judgement of the weather and sound technical skills when moving on steep ground. These courses aim to cover these areas whilst ticking off some wonderful mountain routes at the same time! Learn with the professionals how to safely plan and head on a day out scrambling in the mountains of the UK. 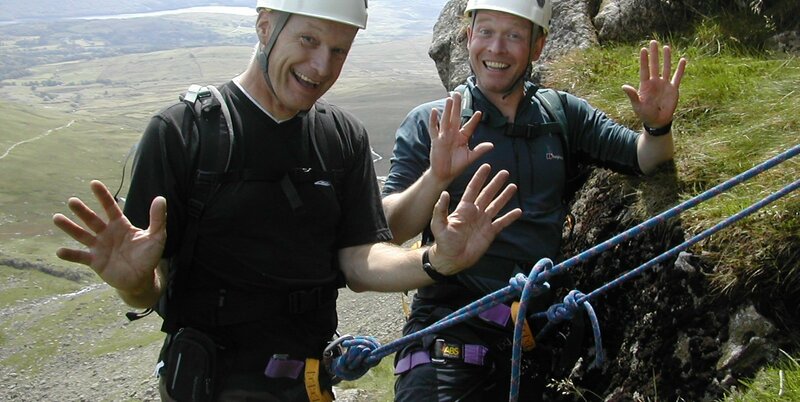 This is a two day course for those of you who have tried scrambling before and now want to be able to navigate the easier grades for yourself learning about the hazards, how to select a route and how to interpret the guide book and follow a route. Two or more of you who want to book this course now? Let us know when you want to do this and we’ll set it up for you! For those of you bitten by the bug and looking to take the adventure further, we take the time to teach you the skills to tackle harder and more committing routes on this 3 day course. The training aims to consolidate the lessons from Scrambling Improvers and gain further mountain skills to get you started independently on all grades of route. Plus, at a leader to client ratio not exceeding 1:2 you’ll get to sample some fantastic high and airy grade 2 and 3 routes . . . bring it on! The course is delivered over three days including 1 day at the rock face learning the principles of leader-placed protection and climbing. If you prefer, this course can be delivered in two parts with 1 day one week and the subsequent 2 days another week. Just let us know. Scrambling and good mountain navigation go hand in hand. Learn how to read a map and use a compass on one of our excellent navigation courses.